Hello from Scotland everyone! I hope you are having a great day and welcome to a new Simon Says Stamp blog hop to celebrate Blossoms and Butterflies release here! Today I'm sharing ideas using Dhalia Frame Wafer Die, Floral Mix Background, and Tiny Words Encouragement Stamp Set and a 5- minutes video to show you the process. I also used every single die cut (nothing was wasted ) and I defo had to try different colours!! I heat emboss the backgrounds on Arches watercolour paper using embossing powders and Simon Says Stamp clear ink. Then I applied different shades of Nuvo Aqua Flow Pens over the paper and I sprayed loads of water. I allowed to dry and I used Dhalia Frame Wafer Die to cut the backgrounds and this allowed me to create a dimensional framed composition. 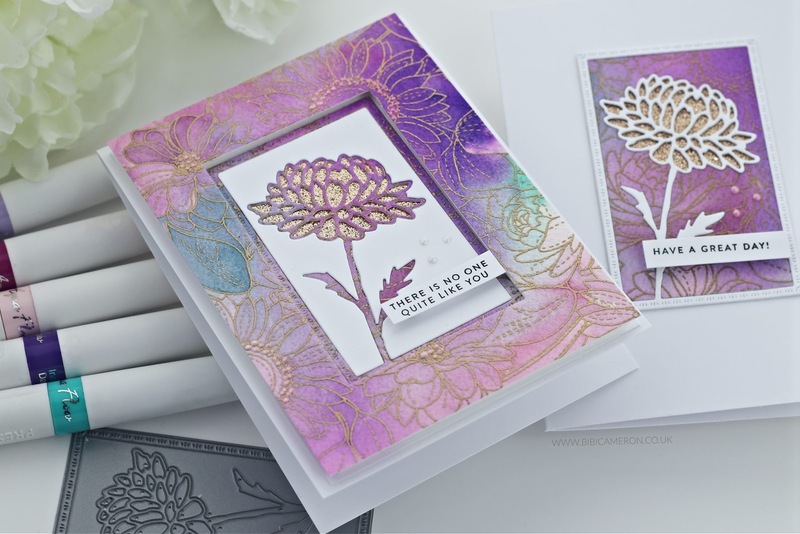 Behind the die cut flower, I added Craft Perfect Glitter cardstock in a colour that coordinates with the embossing powder used for each card. Tiny Words Encouragement Stamp Set was perfect to stamp small banners to add to all my projects today. I also used a couple of dies to cut a gift box and a tag. All the products used to create projects in this post are listed below. 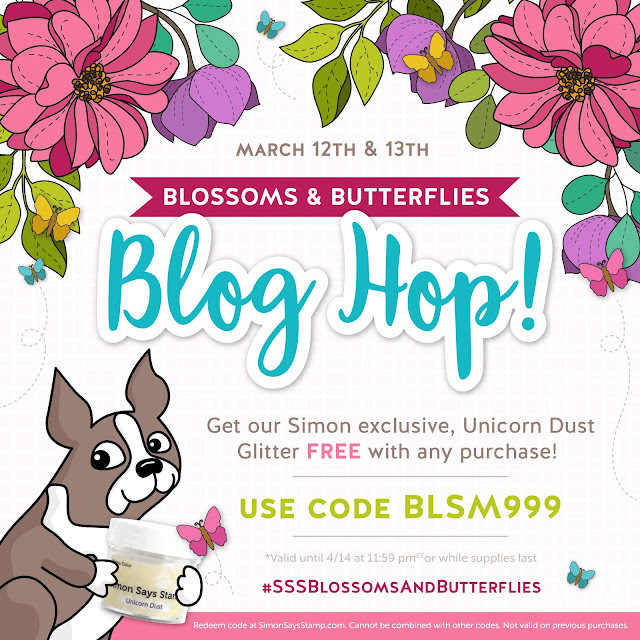 Simon Says Stamp is giving away a $25 coupon to every stop on the hop from your blog. Leave a comment for your chance to win. Bibi Cameron You are Here!!!!!! Beautiful assortment of cards. Definitely my favorites are the blue set of cards. Beautiful backgrounds they really set off the dies. WOW, each color has it's own wow factor. Love the glitter card stock and that you made and showed two cards from each. They just seemed to get better and better and I viewed them! What a fantastic way to deal with the die-cut!! LOVE the blues! But a great series of cards. I love all of your flower cards!! I think my favorite color is the blue one. They are all beautiful colors though. Hi, I’m new to your blog found you through the blog hop. So glad I did i absolutely love these cards they are maxing! The colours are just my thing. You’ve really inspired me. Thanks so much for sharing. Have a wonderful weekend. Absolutely GORGEOUS backgrounds --- I love them all! Your cards are all so very gorgeous!! Love the different color options you chose! Love these cards! :) They are so pretty. I loved all your cards. They are a wonderful use of this new release from SSS! Actually, I may have loved the blue cards a little bit better, because blue is my favorite color! LOL! These cards are gorgeous and I appreciate that you show how many ways they can be done!!! Beautiful!!! So very pretty. I enjoyed seeing the cards in different colors. They are all pretty but my favorite is the blue tones. Very pretty cards. I really liked that you showed them in different colors. My favorite is the blue tones. is my fave (my fave color anytime). send any of them to a friend. Beautiful colors on all the cards and so hard to choose a favorite color but I think I'll choose the pinks because I really like the pink embossing on the flower making it stand out more. Thanks for sharing and posting. WoW! 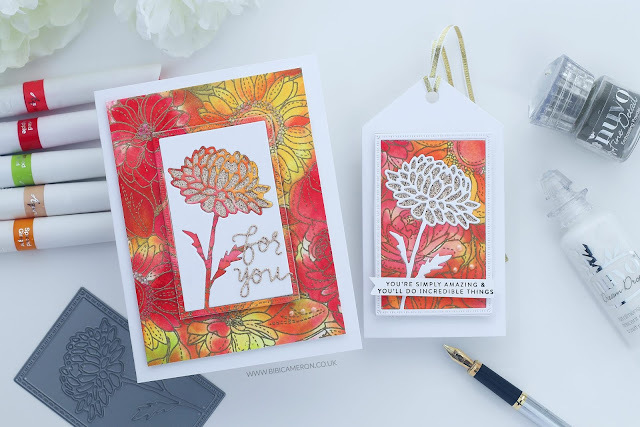 You have certainly been busy creating all those stunning cards, Bibi! At first I was sure it was the blues that were my fav, but the more I looked, I just couldn't decide. They all had such rich, vibrant colours! Love the addiction of glitter paper behind the di cut flowers! Thanks so much for sharing your wonderful inspiration! Oh my Bibi, what a stunning cards and tags! I love them all and it is difficult to choose one, I am going today for the third card, the red/purple ones. Thank you so much for this awesome inspiration and have a great Sunday. Stunning. Leaning towards the blue but boy, that red one sure did catch my eye! Love your cards! You did such a great job with the Dahlia that it is already sold out at SSS. Definitely on my wish list. Wow! These are so great! I hope I can remember how you did them. I think I like the blue ones best, but they're all pretty. So elegant and beautiful! !I was debating on this stamp and die but you sold me! OMG - these are stunning, absolutely stunning. I love what you've done with these cards. oh my love your two-fer cards - stunning collection!! Gorgeous, Gorgeous, Gorgeous! Love every card! So neat how you used every scrap, and made two cards of each one! Absolutely gorgeous cards!! I love the purple!! These cards are beautiful! I think I like the purple one the best. Fantastic selection of cards - I loved the blues , and then the warm orange and red, they are gorgeous. 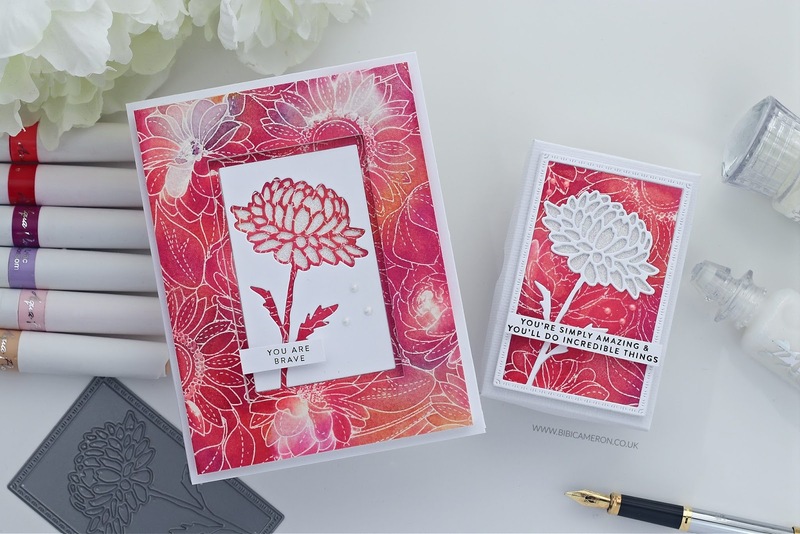 Love the dahlia cards. Your use of color is stunning. I like how you can get two cards from one. Thank you for sharing and the inspiration. I really like the way you created all of those marvelous frames! All so unique and gorgeous! 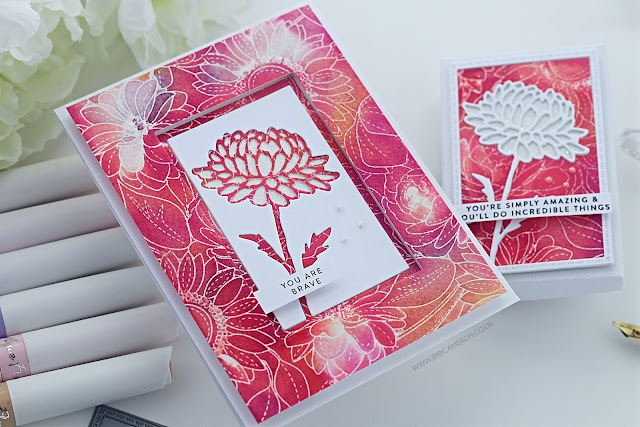 The dahlia cutout die is a wonderful showcase to the frame. Fabulous work! really,they all look so wonderful but I am especially loving the blue. Super use of all the parts of the die cutting! My goodness these are exceptional cards. I absolutely love them. The coloring, the design, the sparkle. My favorites. I just love how you created the gorgeous backgrounds! Thanks for sharing so many different colour combinations - they're all beautiful. Your cards are exquisite! I like the purple color the best. Simply stunning cards! You rocked this release! Wow! These cards are gorgeous. I love the background stamp. And the video is very helpful in explaining the great video you made. My favourite colour combo is the first one. 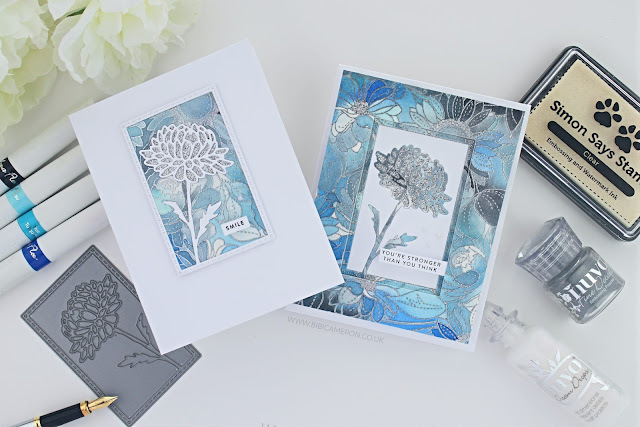 Just love the grey and blue shades with the silver embossing. These are freaking amazing Bibi!! I definitely want to case these in some way with my own supplies!! I love the look and have to try it! 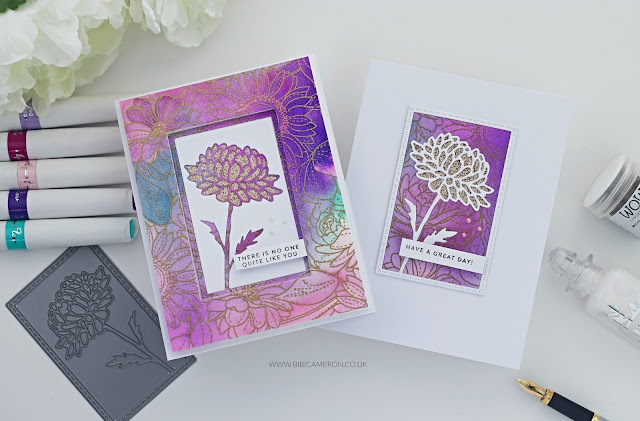 Great cards, the background colors I love, the embossing and thanks for sharing your inspiration! Very beautiful! I tend to like the blues! So I like the blue ones best! Gorgeous cards. All the colors are wonderful, but my favorite is the purple. I love those frame dies. What beautiful cards!!! I love them. What inspiration. Bibi-you’re easily one of my favorites. Thank you for sharing. Great backgrounds! Thank you for doing so many. Beautiful monochrome colors! I love the blue one! Wonderful cards from soft to bold colors and so versatile for any number of occasions. Thanks for the inspiration! They are all very beautiful and it is very difficult to pick a favorite color. The shades of blue are my favorite, followed by the red, next would be purple and finally the red-yellow one. Not familiar with those watercolors, but they seem convenient for this technique and so vibrant. Thank you for the inspiration. Love this!! My Favorite. I bought this die. But i might need these pens too. Thank you. i too, like the blues and purples. Wonderful cards!! Love them all but the first one in the blue shades is my favorite! A great way to get a twofer!! Oh my goodness.....which one is the best? I don’t think I could ever choose one....they are all just gorgeous!!!! Thank you so very much for that wonderful video. It shows exactly how these were created....such beautiful work. Thank you so very much for sharing today...I hope you are having a wonderful weekend. Hugs! I love all of you cards but the blue is my favorite. WOW They are all so beautiful. I just can't pick out a color. Your projects are all so beautiful (blue and purple are my favourite). You did an amazing job designing and creating them. Thank you for sharing. Your cards are all very beautiful but I think the blue us my favorite. You are very talented. You are so creative. Love, love, love them all, but the blue is my favorite. Such a beautiful collection of cards! Stunning! Seeing all the color variations is such fun. I agree with the last comment that blue is my favorite too. all your cards are gorgeous! I love doing cards that way too....easy to do using different color combos, but smae design...nice job! Blue is my favorite color and the blue cards are my favorite of all of these. But, I would love to be the recipient of any one of these beauties. ok wow...quick and easy coloring, and yet it's so dang gorgeous. Your card are absolutely beautiful. Think my favorite is the purple but they are all gorgeous. Thanks for sharing your talent. Love how you colored your cards. Beautiful job. Great use of the SSS products. Thanks for sharing your creativity! Hi Bibi. I'm so disappointed you didn't speak while making this FABULOUS Youtube, as I was dying to hear your beautiful Scottish accent. LOVE hearing Celtic accents!!!!! Anyway, your cards are more than stunning - I would never have thought to do what you did, and that's why you are a designer and I'm not, I suppose. The backgrounds were all so beautiful and the resulting cards, tag, box are all stunning. I can't believe you didn't have more cardstock underneath while you were creating those backgrounds to sop up all that wonderful colour, LOL. Anyway, you made my day. 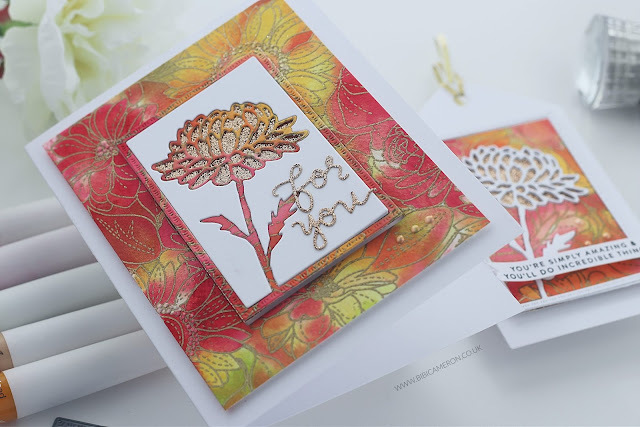 Am loving this new SSS release and the images, sentiments, stamps are all just great and a "must have" for me. Thanks so much for sharing. Sorry about the novel, I am super wordy. Bev from Australia. Wow!!! These are GORGEOUS!!!! I love that box!!! All the colors are so pretty but I'll choose the purple and gold as the one I like best. Beautiful cards. So pretty! I love the stamp and the die! I think I like the blue and silver one the best! OMG!! I'm in LOVE with your process Video!!! I dunno why, but that was fun to watch!!! My Fav. is the Blue/purple.... but I LOVE how they ended up!!! Very well done!!! What pens where those that u used at the begining??? TFS!!!!! These cards are all stunning!! Absolutely gorgeous! Thank you for sharing. Awesome release, awesome, absolutely gorgeous creations! Such beautiful cards! Love the series of the framed floral designs! Awesome dies! All of the versions of the card are lovely but my favourite colour combo is the first moody blues and greys one. Bibi, your creation as always, are amazing. The blue is my favourite but they are all stunningly beautiful. Wow, amazing set of cards!! Love the designs with the frame, and the fact that nothing was wasted! I hate waste! :D The colours and embossing look just amazing! The Dahlia frame die is a delight, as well the floral background stamp!! Thanks for sharing! These are beautiful! I love the way you colored the background image. Wow! So so pretty! Gorgeous embossing!! Absolutely love your cards; especially the pink one stole my heart. Thanks for the great inspiration! Your cards are all beautiful, love the colours. Wow, these projects are so amazing, you do beautiful work! Beautiful cards and love the variations your presented. I love the first couple with the shades of blues the most! Stunning cards, Bibi, I love them in all colour variations! They look fabulous! These are beautiful and look like so much fun to make. I'm a huge fan of the blues and silvers. Thanks for sharing! I am leaning toward the blue/grey but the purple is a close second. This background floral is so beautiful. And I also like the framed florals. Your cards are a perfect example of how wonderfully they work together. Thanks so much for sharing these lovelies. Love those gorgeous backgrounds! Thanks for making a video showing us how you made your cards...really love how you used the floral die on the beautiful backgrounds you created! Absolutely gorgeous cards! I love floral backgrounds and the framed die cut flowers are awesome. Gorgeous cards! I really love the blue color. So soothing. SWOON!! I LOVE LOVE LOVE these!! Such BEAUTIFUL Card Designs!! THANKS SO MUCH for sharing and have a FABULOUS WEEKEND!! Love the backgrounds on your gorgeous cards and the colors are lovely! Wow, gorgeous!!! I love all of them but I love the blue ones!! Spectacular!! I love the idea of making two cards out of one background. I love these in all the colors, especially the reds. Wow! Amazing cards! Love all of the colors! I have to try this! Your cards are absolutely beautiful! So much sparkle and shine! And I really love the new Flower Frame dies from SSS that you used. My favorite cards are the ones with the purple / pink inks and the dahlia outline. ,3 I think my favorite is the blue set! another great idea to make a gift set! Stunning. Beautiful clear presentation! Thank you. Fabulous cards! Loved your video, techniques and fun coloring. Wow! you have outdone yourself! These cards are just amazing! Oh wow!!! Your colouring is simply breathless!!! Wonderful set of cards!!! My fave is the blue set. Wow, gorgeous creations! Thank you for great inspiration. WOW! These inspire so many creative ways to use one die. Fabulous! Bibi, your cards, little box, and tag are just gorgeous, but the blue and silver cards with the white have stolen my heart! I love the process of watching you work the colors of all of them. Thank you for such great inspiration! 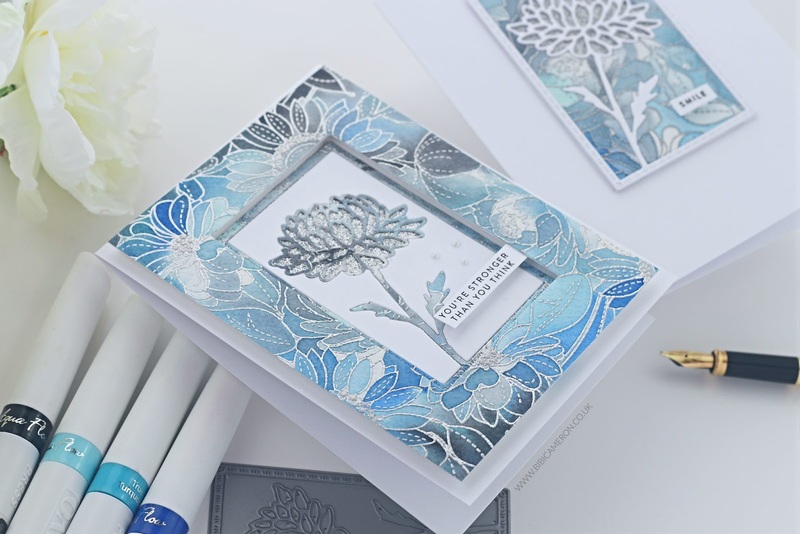 I'm a huge fan of blue anyway, so that would probably be my favorite no matter what, but I particularly like how the silver embossing powder makes it look like the dahlia is layered over a stained glass window. Thanks for sharing these gorgeous cards with us! Beautiful cards! Awesome new release from SSS! WOW! I just love all the colour combo's. Love the touch of gold in the one. But my favourite is your first one. What fun and fast cards! I am going to have to try this! Great design. I think I like the reddish one. Wow, the BG is stunning in all the cards, love the color combos and also that nothing was wasted. This die is so pretty...amazing job on these cards.